WEST YARMOUTH, Mass. – An American League All-Star catcher, the Cape League’s all-time saves leader and a longtime player, coach and administrator are among eight men who’ll comprise the 14th Cape Cod Baseball League Hall of Fame class to be inducted Saturday, Nov. 16, at the Chatham Bars Inn. Hall of Fame Committee member Jim Higgins made the announcement Sunday, June 9, during the league’s annual First Pitch Brunch at the Ninety Nine Restaurant. Inductees include current Baltimore Orioles star catcher Matt Wieters (Orleans ’06), Cape League single- season saves leader Ryan Speier (Bourne ’01), and the late Merrill Doane, a longtime player, coach and administrator from Chatham. Also scheduled for induction are former league MVP Daniel Carte (Falmouth ’04), former major league and Cotuit infielder Garrett Atkins, 1970 league MVP Jim Prete (Wareham ’66, ’67 &’70, Bourne ’68), slugging first baseman Ed Drucker(Harwich ’66) and undefeated southpaw pitcher Mickey O'Connor (Chatham ’76). The UCLA corner infielder played for the Kettleers in 1998 and ’99, finishing second behind Bobby Kielty the first summer with a .383 batting average, 51 hits and a spot on the CCBL All-Star team. Atkins followed that with another solid campaign in ‘99, hitting .312 with 35 RBIs and went 2-for-3 in the All-Star game to earn MVP honors by leading the West squad to a 6-4 win. He led Cotuit to the CCBL title and was named playoff MVP in the process. The Orange, Calif., native was selected in the fifth round of the 2000 draft by Colorado and enjoyed an eight-year major league career with the Rockies and Baltimore, hitting a career .285 with 99 home runs and 488 RBIs. His best season was 2006 when he hit .329 with 29 HR and 120 RBIs with Colorado. He hit a home run in the 2007 World Series vs. the Red Sox. The slugging right-fielder from Winthrop College recovered from slow start for the Falmouth Commodores in 2004 to become the league’s Most Valuable Player. He hit .308 and led the CCBL in home runs (11), RBIs (38), slugging percentage (.560) and extra base hits (17). Following his magical season when he powered the Commodores to the championship series, Carte was named Summer League Player of the Year by Baseball America. The previous summer, he was named MVP in Great Lakes League. The Hurricane, W. Va., native was selected in second round of 2005 draft by Colorado and played six seasons in the minors, hitting .272 with 61 homers, 115 doubles and 316 RBIs, including 2008 when he batted .273 with 10 homers and 59 RBIs with Class AA Tulsa. Carte served on Falmouth staff in 2011 and enjoys a similar role with West Virginia. In a Cape League career that spanned more than 60 years, Chatham’s Merrill Doane did it all. Starting as a player for the first Chatham Town Team in 1923, he went on to become one of the longest tenured general managers in league history, serving for several decades. In the 1960s, working with CCBL Hall of Fame managers Joe Lewis and John Carroll, Doane helped build some of Chatham's most powerful teams, including the 1967 championship squad that included eventual CCBL Hall of Famers Thurman Munson, Ed Baird, Joe Jabar and Steve Saradnik. Doane’s teams also made it to the playoff finals in 1964, 1965 and 1969. Doane was one of the Lower Cape representatives who in 1962 fashioned the merger with Upper Cape teams that created a single Cape Cod League, which debuted in 1963. Merrill remained active with the Chatham Athletic Association, attending meetings into the 1980s. He donned a uniform and participated in the CCBL Old Timers Game in Orleans in 1985 at age 78, the oldest player on the field. ThesluggingSouthernConnecticutfirst baseman hit .382 for Harwich in 1966 and led the CCBL with eight triples and 18 extra base hits, while being named league MVP. He was named to the CCBL All-Star team and led the Lower Cape squad to a 5-1 victory, going 1-for-3 with three RBIs. Drucker was offered a contract with the Baltimore Orioles at the end of the season but returned to college, where he hit .315 and led the Owls to a 20-2 record. As an end and punter, he helped the Southern Connecticut football team fashion back-to-back conference titles and was signed as a free agent by the San Francisco 49ers. TheSt.John’ssouthpaw posted a perfect 9-0 record for the Chatham A’s in 1976 with a 1.07 ERA, completing eight of 10 games and striking out 47 batters and walking 17 in 84 innings. In the All-Star game against the Atlantic Collegiate League, O’Connor hurled three scoreless innings and allowed just one hit. He posted a 1-1 record in the playoffs for the A’s, compiling a 1.65 ERA, and was named to the All-League team and was voted the league’s Outstanding Pitcher. The 6-6, 210-pound left-hander was drafted out of Christ the King High School (Queens, N.Y.) by the New York Mets in the 26th round in 1974 and again in 1977 in the 16th round by the Minnesota Twins. He pitched two seasons of Class A ball for Wisconsin Rapids in 1977 and Niagara Falls in ’78. Jim Prete, a baseball star at Bourne High School, knew he was good enough to play in the Cape League even before entering college, so the sure-handed infielder signed with Wareham immediately after his graduation in 1966. He posted a .319 batting average in 39 games. It was the first of four Cape League seasons for Prete, whose best year was 1970 when he returned to Wareham after a season at Bourne and a season in which he was sidelined by a broken leg. Prete hit .336 in 39 games with two home runs, seven doubles, four triples, 17 RBIs and nine stolen bases. For his efforts, he was voted winner of the Pat Sorenti Award as the league’s MVP, the first and only time in the award’s 49-year history that it has gone to a player who grew up on the Cape. Prete also starred at New Mexico Highlands University, where as a freshman in 1967 he led the Cowboys to their first-ever NAIA national championship. In 1970, he was named to the first of his two Tapps All-America first teams. While at NMHU, he made three All-District VII teams and two All-NAIA Area II teams. During summers in the Cape League, he continued his stellar play and was selected for several All-Star games. In 1971, the Senators signed Prete to a minor league contract and after playing for Geneva in New York-Penn League, he hung up his spikes. In 2010, Jim returned to NMHU to be inducted into his alma mater’s athletic hall of fame for exploits four decades earlier. The Radford reliever set a modern-day Cape League record with 16 saves for the Bourne Braves in 2001, allowing only 10 hits, one walk and one unearned run in 20 innings while striking out 35 batters. He pitched a scoreless ninth with one K for the West in the CCBL All-Star Game and was named the league’s Russ Ford Outstanding Relief Pitcher. He signed with Colorado as an amateur free agent in 2001 and made his major league debut on April 4, 2005. The 6-7, 210-pound Frankfort, Ky., native pitched four big league seasons for the Rockies from 2005 to 2009, posting a 7-3 record with a 3.99 ERA in 90 games, including a 3-1 mark in 2007 when the Rockies faced the Red Sox in the World Series. Speier hurled three postseason games in ’07 and earned a save in the NLCS against Arizona. He’s now an assistant coach at Radford. In 2007, when Matt Wieters was wrapping up a brilliant collegiate baseball career at Georgia Tech, he was named a first-team All American for the second time, one of only three players in the school's history to achieve that honor. The Baltimore Orioles star catcher will again join those two other players – Jason Varitek and Nomar Garciaparra – when he is inducted into the Cape Cod Baseball League Hall of Fame. Varitek and Garciaparra were members of the class of 2002, which also included Baltimore manager Nat "Buck" Showalter. 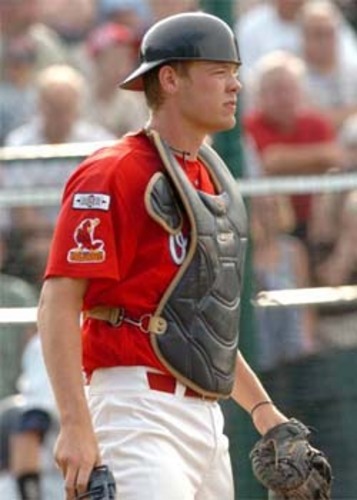 Wieters, catcher/DH for the 2006 Orleans Cardinals (now Firebirds), was winner of the Robert A. McNeece Outstanding Pro Prospect Award that year. He posted a .307 batting average and belted eight home runs, ranking second in the league in both categories. He also pounded out 39 hits and had an on-base percentage of .417. The 6-5, 240-pounder hit some prodigious shots, including a blast off the bandstand at Eldredge Park. The following spring, Baltimore made Wieters its first-round draft pick (fifth overall) and he signed a $6 million bonus contract. He made his major league debut May 29, 2009, against the Detroit Tigers. Wieters was selected for the 2011 and '12 MLB American League All-Star teams and is a two-time Gold Glove winner. A native of Charleston, S.C., Wieters now makes his home in Sarasota, Fla., where he and his wife Maria welcomed their first child, son Maverick Luther, on Sept. 27, 2012.